Nearly 500 alumni, friends and members of the campus community — including retired faculty members — turned out on Friday, Sept. 23, for the official dedication of the Froiland Science Complex. Some people are just unforgettable — especially those who make a difference in your life. So when Becky (Johnson) Blue '81, a nursing major during her time at Augustana, saw Dr. Arlen Viste, professor emeritus of chemistry, and Dr. Roy Kintner, also a professor emeritus of chemistry, at the University's dedication of the new Froiland Science Complex last week, she couldn't help but smile. Nearly 500 alumni, friends and members of the campus community — including retired faculty members — turned out on Friday, Sept. 23, for the official dedication of the Froiland Science Complex (FSC). The event was held nearly 50 years to the day of the dedication of Augustana's former science facility, the Gilbert Science Center. 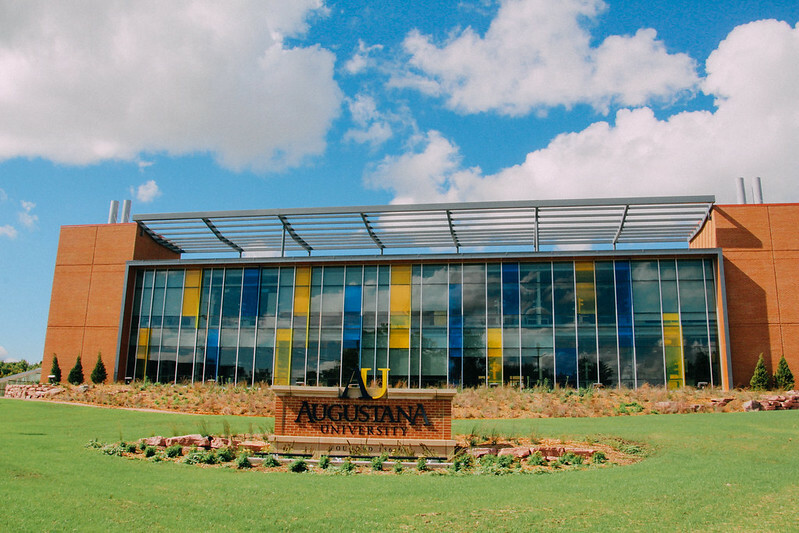 At 125,000 square feet, the facility represents the largest and most complex building endeavor in Augustana's 156-year history. Construction on phase one, a 41,000-square-foot addition at the corner of 33rd Street and Summit Avenue, began in August 2014. Phase one opened in January 2016. Phase two of the project featured a complete renovation of the existing Gilbert Science Center, originally dedicated in the Fall of 1966. Designed by SmithGroupJJR and TSP, the $35 million project features a new, high-fidelity nursing simulation center, multiple technology-rich “classatories” — rooms mixing traditional classroom elements and laboratory components, state-of-the-art research areas for faculty researchers and their student collaborators in areas such as physics, chemistry, biology and mathematics, and glass-enclosed laboratories designed to put “science on display” for all students and further enhance the culture of research that exists on the campus today. Designed with the environment in mind, the new facility is targeting a LEED-Silver designation. The Complex was made possible thanks to the generosity of more than 1,000 donors, 469 of whom gave $1,000 or more in support of the project. In gratitude, their names are listed on the donor wall located inside the facility’s north entrance. President Rob Oliver has called the project a result of dreams — dreams of past professors and those teaching on campus today. "This facility honors the legacy of Dr. Froiland, a champion for biological research on campus. At the same time, it also recognizes our extraordinary emeriti faculty members including Dr. VR Nelson (physics) and Dr. Roy Kintner (chemistry) who helped develop Augustana's natural science division, as well as the amazing professors on campus today who are teaching, guiding and mentoring our students in preparation for lives of exploration, discovery and service." The ceremony's speakers included Becky Blue; Dr. Tom Froiland '65, the son of Dr. Sven Froiland, for whom the facility is named; Dr. Paul Egland, associate professor of biology and natural science division chair; Rob Oliver; and the Rev. Dr. Paul Rohde, campus pastor. Students Allison Warne '17 and Ellen Voigt '17 read scripture and Dr. Martha Gregg (mathematics) recited a poem. Music was provided by Gabriel Carlisle ’15, Luke Lynass ’12, Skyy Pineda '18, Dr. Paul Egland (biology) and Dr. Craig Spencer (biology). See lyrics below. Following the dedication, attendees toured the facility, visited with former and current faculty members and students, and admired the three-story-tall pendulum, designed by Scott Parsons, associate professor of art at Augustana University, and David Griggs. Titled “Foucault’s Dream,” the pendulum is positioned at the facility's north entrance within the staircases. Called a "true blend of art and science" by Augustana officials, the project was supported thanks to a gift received from Howard '50 and Eunice '50 Hovland. The Froiland Science Complex will welcome visitors again in October for Viking Days. Self-guided tours are set for Saturday, Oct. 15. Performed by Luke Lynass ’12, Gabriel Carlisle ’15, Skyy Pineda’18, Dr. Paul Egland, and Dr. Craig Spencer. You get a line and I'll get a pole honey. You get a line and I'll get a pole babe. You get a line and I'll get a pole. We're gonna reach our Froiland Goal. Served us well, all those years, babe. It was showing its age, like some of us. Called for an upgrade, so we stirred up a fuss. White boards? NO! Blackboards YES! Babe. 3. Froiland was a heck-of-a-guy, honey. Other folks, left their mark too. More to come, including some of YOU. 4. Never coulda done it without donors, honey. Never coulda done it without donors, babe. Hope y’all will, come back often.